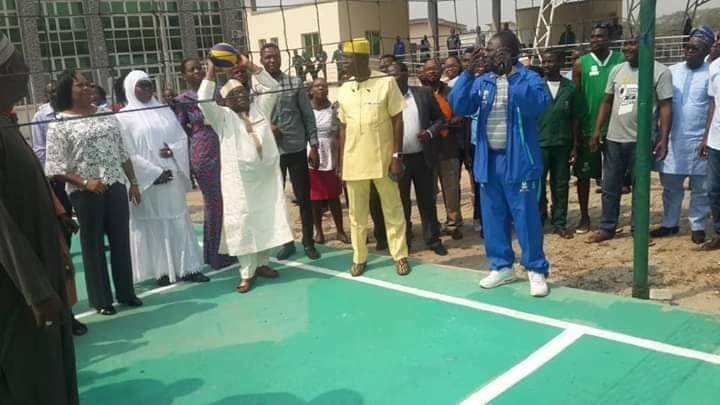 The official handing over and commissioning of the newly built basketball and volleyball courts held on Monday, 28th January, at the headquarters in Abuja. 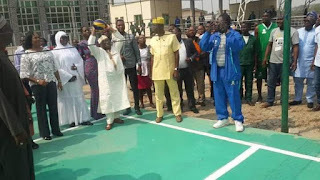 The Vice-Chancellor, Prof. Abdalla Uba Adamu, who commission the two courts was flanked by the Chairman of Sports Committee of the university, Prof. Nebath Tanglang. Other members of the committee: Mr John Ubaji, Mal Isa Shehu, Mr Kazeem; Dr. Adewale Adesina, Mal. Ibrahim Sheme, and Mr Jidda Dakwal, who is also the NOUN Head Coach, were present to witness the epoch-making ceremony. DVC academic, Prof. Joy Eyisi, DVC administration, Prof. Prof. Victor Adedipe, and the Registrar, Mr Felix Edoka, were also present. Prof. Tanglang, chairman of the Sports Committee, while giving his remarks stated that the VC didn't think twice when it came to approving the two courts. He thanked the VC for his supports to sports in the university. The Vice-Chancellor while responding to the chairman’s remarks stated that NOUN's hosting of 2016 NUSSA GAMES in Kaduna was the first time he was entering a stadium. He stated that three others recreational activities are in the pipeline; theater building, viewing centre at the media building, as well as the complete recreational centre, approved by the Council. A full recreation centre, with full gymnastics facilities will also be included. He stated that he is proud of the achievements of NOUN sports men and women and proud that the university has these facilities. Deans, Heads of unit, and a host of other sports loving senior staff and others were in attendance. It is noteworthy, however, to know that a brand new football pitch as well as a garden (to serve as a chilling point) works are ongoing at the headquarters.